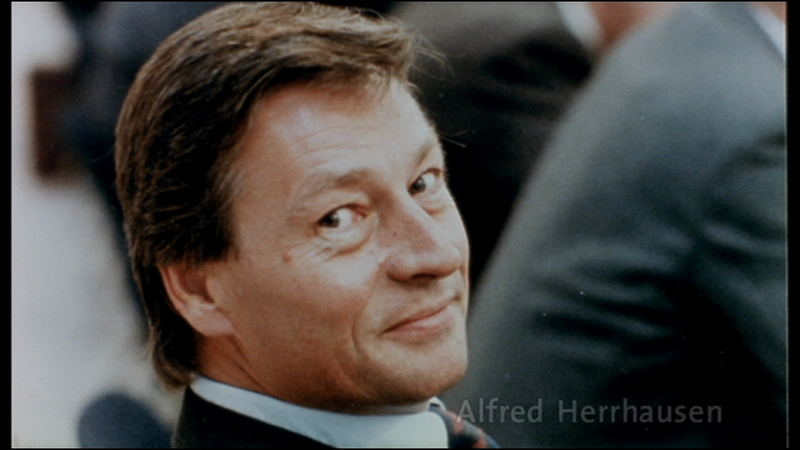 Andres Veiel’s 2001 documentary film, Black Box BRD, links the biography of Alfred Herrhausen, RAF victim, with one of the 3rd generation RAF terrorists, Wolfgang Grams. In my paper, I trace how the film’s aesthetics introduce an image montage of two life scenarios by establishing both parallels and contrast, and therefore, following Susan Haywards definition “creates a third meaning” (112). I examine how the film establishes an aesthetic concept of Aussteigen (getting out)—along of the alive, visible bodies—the contemporary interviewees, and dead, invisible bodies—of Herrhausen and Grams. 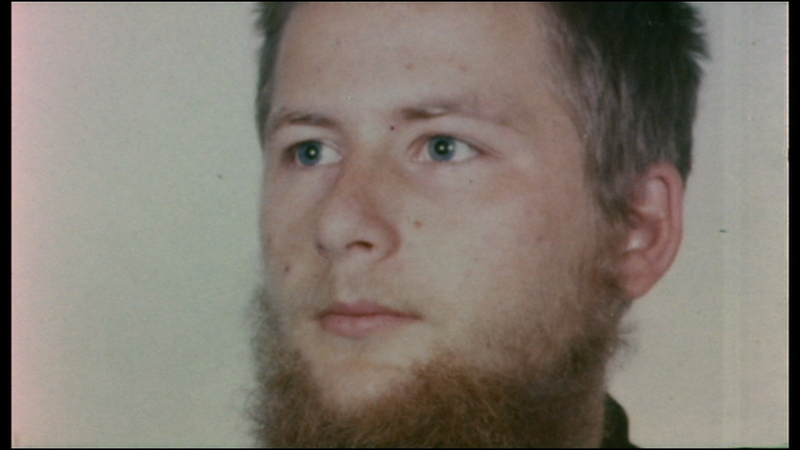 Le documentaire Black Box BRD d’Andreas Veiel explore la biographie d’Alfred Herrhausen, victime de la Fraction armée rouge (RAF), en lien avec le portrait de Wolfgang Grams, l’un des terroristes du groupe de la troisième génération. Dans mon exposé, je montre les procédés esthétiques du film qui établit des parallèles et contrastes entre deux scénarios de vie par un système de montage d’images, et donc, comme le suggère Susan Haywards, “crée un troisième sens» (Hayward 112). J’examine comment le film met en place une esthétique de l’Aussteigen (“se retirer”) – le long des corps vivants et visibles—ceux des interviewés contemporains, et des corps morts et invisibles—ceux de Herrhausen et Grams. Introduction—What is in the ‘black box’? The RAF (Red Army Faction) proclaimed its self-dissolution in March 1998. The almost twenty-eight year revolution took its toll—twenty-six dead people in the ranks of the RAF and 34 murder victims, numerous violent abductions, bank robberies, and bomb attacks. At the turn of the millennium, “a chapter” in the Bundesrepublik Deutschland (BRD), the former Federal Republic of Germany (FRG), “closed,” and at the same time an opportunity presented itself for society “to come to terms with the causes,” aftermath and the effects of left-wing terrorism (Volk 9). 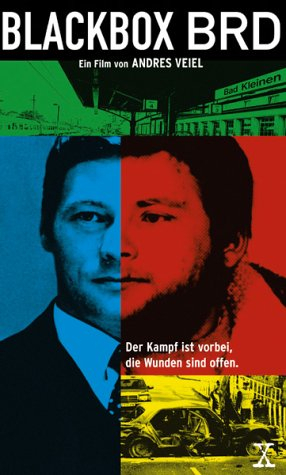 In terms of the “collective memory” of the RAF, what is foremost present in people’s minds are the iconic images of the first-generation RAF, including Andreas Baader and Ulrike Meinhof, their arrests, the mug shots, their imprisonment in isolation in Stuttgart-Stammheim, which then led to the actions of the second-generation. Mostly known is the Commando “Big Raushole” (Big Break Out)—the code word that the second-generation RAF used for the planned liberation of Andreas Baader, Gudrun Ensslin, and other first-generation RAF members who were imprisoned in Stammheim (Passmore 109). In his 2001 documentary film Black Box BRD, Andres Veiel shifts focus to the more cerebral third-generation that was active between the early 1980s until the liquidation of the group in 1998. Unlike in the 1970s, the RAF was by then quite isolated from the radical left wing in the BRD and without an extensive net of sympathizers (Veiel, “Black Box BRD” 270). 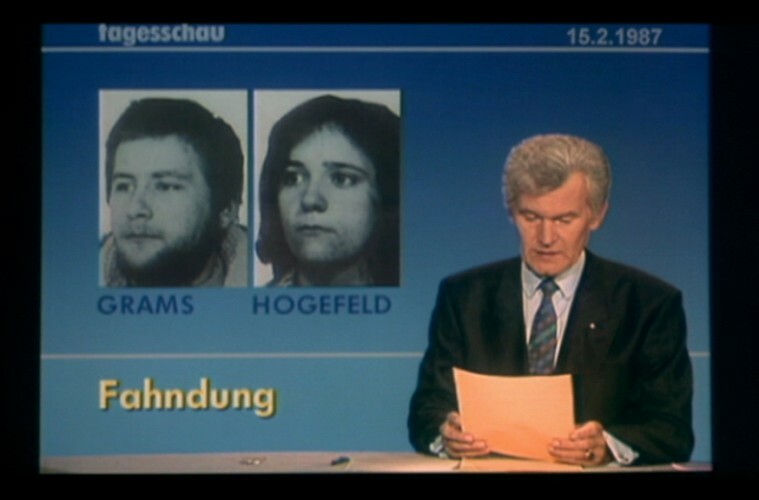 The third-generation instead perpetrated specific systematic assaults (Volk 22), such as the bomb attack on the Rhein-Main Air Base on August 9, 1985, the murder of the Deutsche Bank CEO Alfred Herrhausen on November 30, 1989, and the execution of the president of the Treuhandgesellschaft (trust company), Detlev Carsten Rohwedder on April 1, 1991 (25). The third-generation RAF supposedly carried out ten murders between 1985 and 1993. Wolfgang Grams and Birgit Hogefeld reputedly acted as commandos of these operations (Veiel, “Black Box BRD” 211). Left-wing terror was not yet at an end, but the third-generation itself and then society’s coping with the terror caused by the third-generation took a different path. Herrhausen’s assassination, in particular, “soon disappeared from the headlines.” The “reunification” of the BRD and the Deutsche Demokratische Republik (the German Democratic Republic, or GDR) was right around the corner. “The murder and its aftermath” got lost in the excitement about “the tremendous political changes at that time” (Veiel, “Black Box BRD” 267). The film, as pointed out in the research, approaches the topic of the third-generation RAF by developing parallel portraits of RAF victim and Deutsche Bank CEO Herrhausen and the murdered RAF terrorist Grams (Homewood, “Making Invisible History Visible” 231) (see figs. 1 and 2). By interviewing associated people from the respective social spheres of both Herrhausen and Grams, Veiel creates a montage of two ‘life scenarios’—a term I use to highlight the constructedness of the “film narrative” (Trnka 4)—that at first appearance do not have much in common (Trnka 11). While some scholars (Homewood, “Challenging the Taboo” and “Making Invisible History Visible”) draw upon theories of “collective memory” to read Veiel’s approach, I will pursue, following Sabine Hake’s labeling of Black Box BRD as an “essay film” (211) the question of how the film portrays two human beings in their absence, establishes an aesthetic image concept of Aussteigen (getting out), and communicates the driving forces for their personal and political acts (Volk 9, also Griese, Palfreyman, Trnka). Through the montage of the images of the living and dead, the visible and invisible bodies, also emerges an image of a nation at a specific time period, the beginning of the twenty-first century, which has been coined by the so called ‘Erinnerungsboom’ (boom of remembrance) of both the Second World War and left wing terror. Therefore, according to Homewood and Trnka, the two threads of Herrhausen and Grams could also be read on a larger scale as the narrative, namely a montaged portrait of the BRD, as the film title suggests—meant to “demystify” the third-generation (Thomas Elsaesser 12) This ‘demystification’ is still going on today, as there was the twentieth anniversary of Bad Kleinen on June 27, 2013. Twenty years after Bad Kleinen, the media and the research on the topic still discuss, to quote Butz Peter’s book title, The last myth of Bad Kleinen. Veiel, as a director in the early 2000’s, was able to take a neutral stance on the left and right even though he cannot be completely neutral, since he is a product of his society and its historical movement (Volk 9–10). Although the film is a documentary and not a narrative fiction, the director chose the images we see, and thereby manipulates the viewer’s understanding of the topic. Black Box BRD’s film aesthetics establish a montage of double subjective narrators—the interviewees that tell their story and the story line cut by the director. This approach is subjective and selective (Volk 10) and highlights the subjectivity of what might be a ‘collective memory’ and how it is a mystification (Assmann 188). In this essay, I will analyze how Herrhausen’s and Grams’s contemporaries represent themselves and are, in turn, represented by the filmmaker in montage. After discussing a few theoretical thoughts on the film’s specific documentary style, I will focus on selected images and sequences that capture the similarities and differences between Herrhausen and Grams. Finally, taking into account Veiel’s book and interview statements, I will show how the montage narratives create a “framing” (Hayward 162) of the concept of Aussteigen, tying in a larger framework of the nature of the third-generation RAF and Germany’s failure to process this final phase of RAF terrorism. The factual uncertainty of Grams’s involvement in Herrhausen’s murder makes the approach of this documentary more interesting. 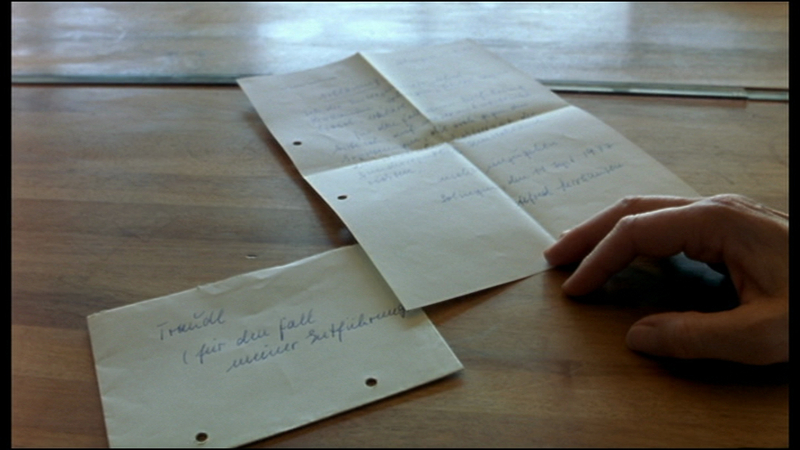 Through its refusal to answer this question definitely (Volk 10), the film maintains its tension (Öhner 25). It focuses on the tragic-moral question, which is continually intensified throughout the film, of whether Grams is Herrhausen’s murderer. This effect results from the documentary’s technique of omitting a direct interviewer (Griese 166). It plays with this trope by establishing “a comparative temporal structure that analyzes,” according to Christina Gerhardt in her essay on ‘Narrating Terrorism,’ “events both synchronically and diachronically” (66). On a synchronic level, the film portrays Grams and Herrhausen. “The majority of films about the RAF organize their narratives diachronically” (66). 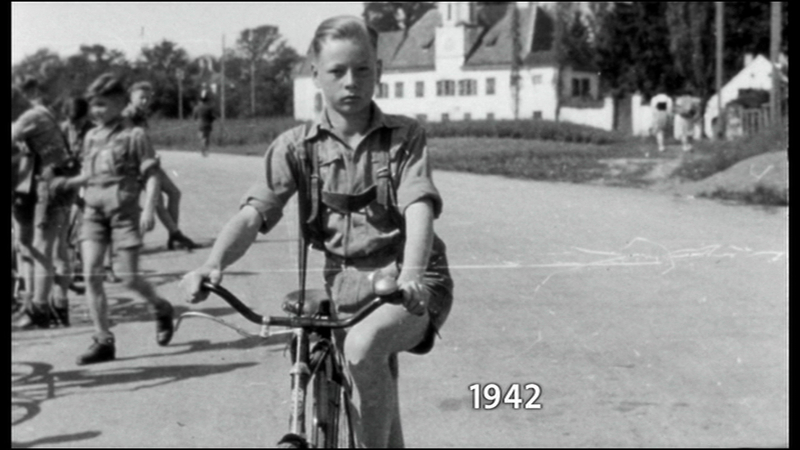 The film starts by elaborating on how Herrhausen’s and Grams’s paths (may have) crossed. On September 11, 1977, the board member of the Deutsche Bank, Alfred Herrhausen wrote a letter with the following words: “In the case of somebody kidnapping me, I do not want the government to respond to the kidnapper’s extortion, which is against the constitutional democracy.” He put the letter in his night table, consciously taking this action five days after the kidnapping of Hanns-Martin Schleyer, at that time deutscher Arbeitgeberpräsident (President of the German Employers’ Association) who was later killed by the RAF on September 18 (Veiel, “Black Box BRD” 118). Herrhausen wrote this testament during the so called ‘German Autumn,’ a set of events in late 1977 that included kidnapping and murder by the second-generation RAF, who demanded, according to their Big Raushole commando, the release of RAF members detained in prison. Herrhausen knew, in tragic foreshadowing, that he could be on the list of the RAF (118). 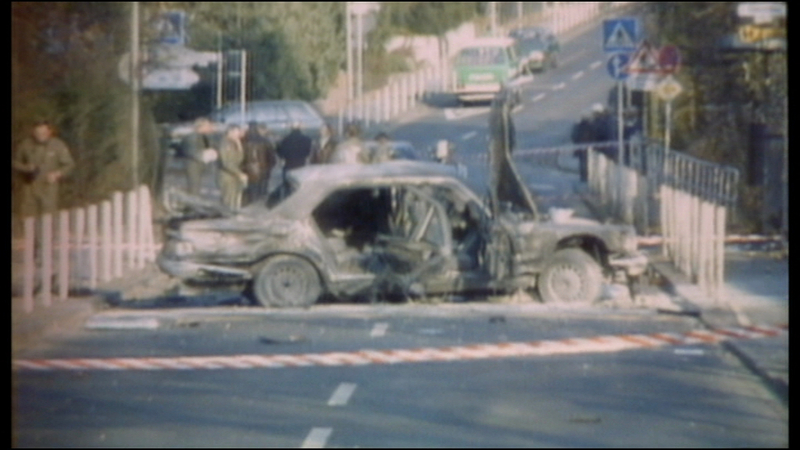 Twelve years later, on November 30, 1989, Alfred Herrhausen’s wife Traudl hears a bomb detonate: her husband has been killed on his way to work just a few minutes after he left the house (9). 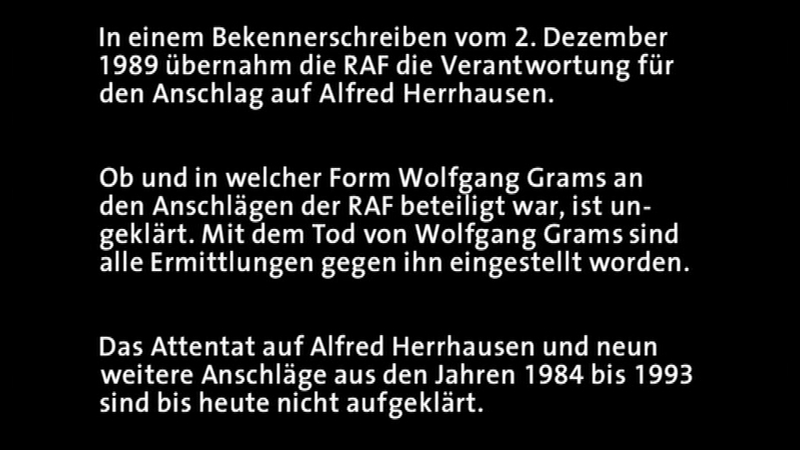 Today it is still not clear who killed Herrhausen (22), but the third-generation RAF member Wolfgang Grams is suspected “to have been implicated in the murder” (Gerhardt 66), though this has never been verified. He was never charged with the assassination, since he died in an operation by the counter terrorism GSG9 commando on June 27, 1993 in the Mecklenburg town of Bad Kleinen (Homewood, “Challenging” 120). The unit member Michael Newrzella was shot by Grams and died from these wounds. Grams, also severely wounded, died shortly after Newrzella. It has never been resolved whether Grams committed suicide or whether he was mortally shot (Veiel, “Black Box BRD” 275). That led to conspiracy theories questioning the role of the Federal Republic of Germany, confidential informants and intelligence services being possibly involved in the murder of Grams (21–22). The confidential informant, Klaus Steinmetz, who worked for the Verfassungsschutz Rheinland-Pfalz (Federal Office for the Protection of the Constitution Rhineland-Palatine), and who had held a position in the commando level of the RAF since 1991, had initiated the stop at the train station in Bad Kleinen, after he led himself toward the RAF since 1991 (273–74). Grams’s girlfriend, Birgit Hogefeld, also present in Bad Kleinen, got arrested for various charges caused by the RAF (274). She was released in 2011 from prison as the last RAF member. Veiel identifies two “tension-filled subjects” by linking these two biographies. Furthermore, the film tells us, as the title suggests, about a “blind spot,” the unresolved case, in the history of the RAF terror in the BRD, and it attempts to offer insights in to this black box (Griese 170). The uneasiness of the unresolved case enhances the viewer’s understanding. Pairing Herrhausen and Grams is a way to demystify the unsolved case—a risky approach since one can easily undermine the assumption that Grams killed Herrhausen (Öhner 25). 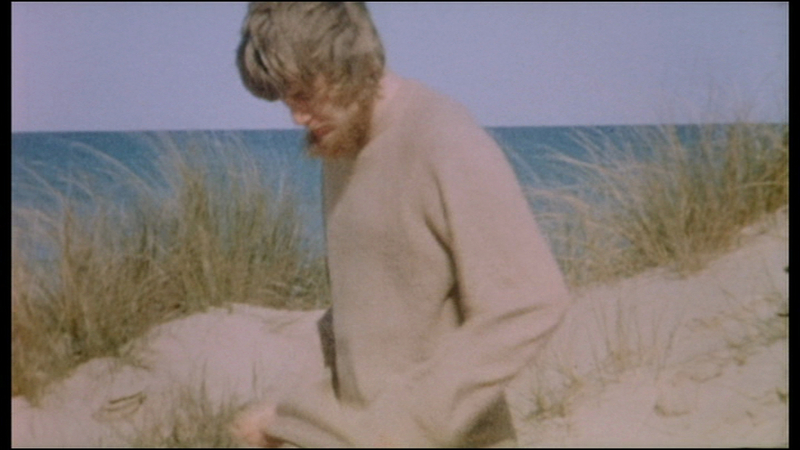 The film succeeds through the montage and the double narrator “without a moderating voice” (Palfreyman 32). At first glance, the story-telling technique uses no explicit narrator. The interviewer Veiel is “visually” and “acoustically” absent (Griese 166). In the interview sequences, no questions are explicitly posed. In addition, old photo and film material is provided and edited in-between the close-up interview sequences. Panoramic shots of Frankfurt alternate with interviews and re-contextualized passed-on images of the main events in the history of the RAF and the BRD to establish a common thread (Palfreyman 29). Michael Haberlander highlights pointedly in his review that the viewer does not need any “Denkhilfen” (clue indications) to “visualize the set of events and the people involved,” and nor even to “see through” to the—“to some extent”—“hanebüchene Geschwätz” (outrageous gibberish) as enacted in the set of the following three scenes (Haberlander): Herrhausen’s twin sister, Anne Koch is positioned in front of deer antlers, as she explains how her brother always worked harder than the mediocre majority of society (fig. 3). The antiquated antlers underline the absurdness of Koch’s expressed Protestant work ethic (Trnka 15). 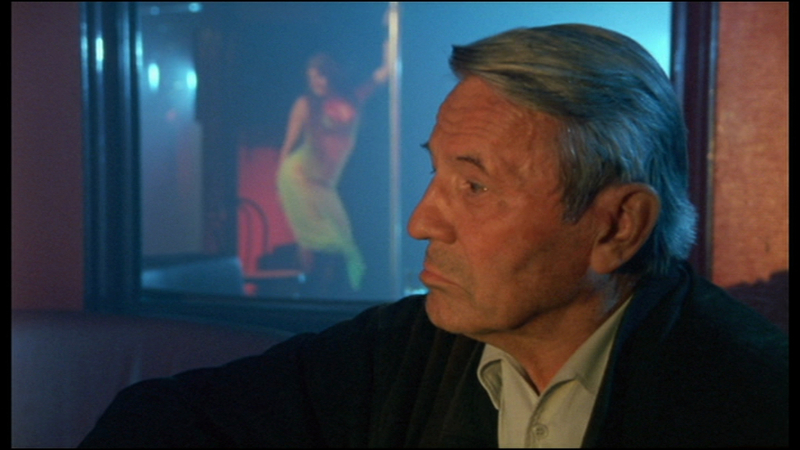 Paul Brandt, a friend of Herrhausen, sits in front of a pole dancer and smirks as he describes how much Herrhausen enjoyed these nights of sexual entertainment (fig. 4). In the next scene, Gerd Böh, a close companion of Grams, sits in front of his bourgeois arbor, wearing a handlebar moustache, as he explains “that one had to see the big bosses” only “in ihrer Funktion” (in their function) (fig. 5). The film enters the hidden politic of a documentary without commentary. It is up to the viewer to balance out the dissonance of the images and statements. It is obvious: The dramaturgy is conceptualized by the director beforehand. It is a montage. In an interview about his documentary style, Veiel commented on his film technique: “There’s a fine line between my own dramaturgical wish for the development of a person and its own reality. And naturally they collide.” I read this as a double subjectivity established throughout the film via a double narrator. Veiel describes his work “as some sort of scientific expedition”: “That means, there are always certain phenomena in reality,” the director states, “that are seemingly fast and easy to explain. And I see my task in […] digging deeper into these phenomenaid=”_ednref18″ href=”#_edn18″> The thesis of montage first posed at the beginning conflates with the complexity and depth of the “psychological.” The consequential suggestion is maintained through the film, since it narrates two cases of political murder, avoids putting Grams and Herrhausen in pre-assumed roles of antagonists—“perpetrator and victim,” respectively (Homewood, “Making Invisble History Visible” 231). Through its narrative style, the film establishes parallels since the life scenarios are stringently and diachronically reconstructed from childhood to their deaths. At the end, the film suggests, that both were in their own way Aussteiger (escapist) and idealists pursuing the same ideological movement: Herrhausen could not support the stringently capitalist course of the Deutsche Bank anymore and recommended the remission of the Third World’s debts (Veiel, “Black Box BRD” 247). Veiel, in his book Black Box BRD, revealed that Herrhausen stepped back from being the speaker of the Deutsche Bank two days before his assassination (259). Grams, on the other hand, supposedly had thoughts about aussteigen (getting out) as well but failed to find a way to escape life underground (273). He and his girlfriend Birgit Hogefeld stayed in contact with family and friends. She even dreamed about having children and putting the weapons down, according to Matthias Dittmer, a friend of Grams who met him in 1992 while he and Hogefeld lived underground (272–73). Herrhausen and Grams shared, the viewer could assume, the similar status of men who died as a result of their assumed political views. Both seem to have felt uncomfortable in their political boxes. The film plays with this consistent alternation between biographical and political motives of acting. The principle of the “blind spot” (Griese 170), the blank space between the “political sphere and the personal” (167) safe haven, the uneasiness about the unresolved case, reappears as a theme in the interviews of their companions. The film avoids explanations. Rather, like Vrääth Öhner suggests in the film journal Ästhetik & Kommunikation (Aesthetics & Communication), it might lend the reconstructed life scenarios toward an air of “German idealism,” since both Herrhausen and Grams are distinguished in their “unconditional commitment to their beliefs.” The film traces the events and connections of two biographies but does not “investigate further possible evidence for distinction” (Öhner 24). On the contrary, Öhner remarks, “reconstruction of the past results in blurriness.” “Oppositions are softened and convergence established through,” for example, Grams’s father’s past in the Waffen SS and Herrhausen attending an elite Nazi school (25). Towards the end, the film furthers this point, most obviously in Herrhausen’s project of debt forgiveness for Third World countries and in Grams’s wish to end living underground. Following Öhner’s critical statement of ‘blurred oppositions’: Does the film suggest, that RAF member and Deutsche Bank spokesperson, potential perpetrator and victim, in the end both were tragically fighting, but on opposite ends of the political spectrum? It is important to take into account the function of this “blurriness,” Öhner states (25). Through the biographical narration, the political differences of these two enemies would get resolved. This only works because of the film’s “reconstruction of continuities and breaks” in the life scenarios (25). 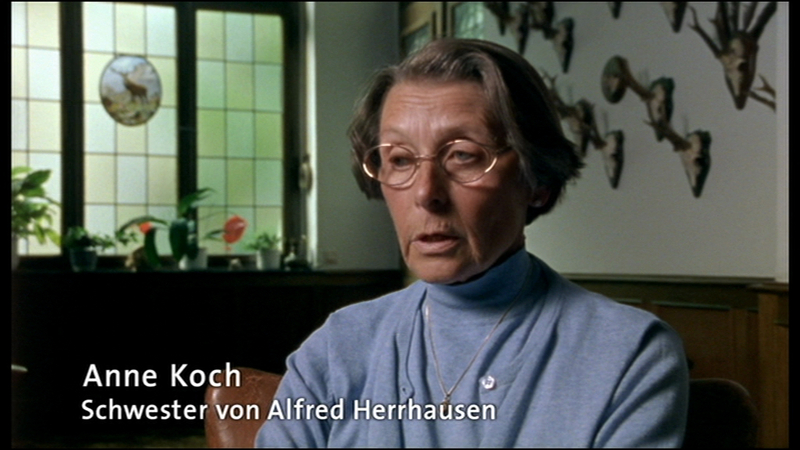 Although I agree with parts of Öhner’s interpretation, I believe that the film does establish significant aesthetic evidence for distinction in the montage of the concept of Aussteigen (getting out)—the alive, visible bodies of the interviewees in contrast to the dead bodies of Herrhausen and Grams. How and in which spaces does the film deal with and represent the contemporaries, the alive and visible bodies? Black Box BRD is a puzzle of contrary images that uses the question of the legitimation of violence to pursue a higher idea—the “blurriness” (Öhner 25) supports the concept of the idea of Aussteigen (getting out)—through the personal and familial development of both protagonists (Griese 167). While this is a reconstruction and a form of remembrance by means of a montage of different voices, it simultaneously describes the slow and inevitable defeat of both Herrhausen’s and Grams’s ideals. This is in spite of and in addition to their real and abrupt loss of life (172). In the following, I will trace selected sequences showing the montage of the contemporaries to be exemplary of the montage of the “slow erosion” of beliefs (172). Traudl Herrhausen describes the night before the day her husband was murdered (fig. 5). She has tears in her eyes as she recalls that they talked about his status as CEO of the Deutsche Bank. He was upset that his financial goals were continually at odds with the board. Traudl tried to take a conciliatory position, to which Herrhausen responded: “If even you don’t support my decision, if even you have qualms, if even you don’t stand by me, then how should I carry on?” What Veiel discovered and published in the book was that Herrhausen announced his resignation as the speaker of the Deutsche Bank on November 28, 1989, two days before his assassination (Veiel, “Black Box BRD” 259). 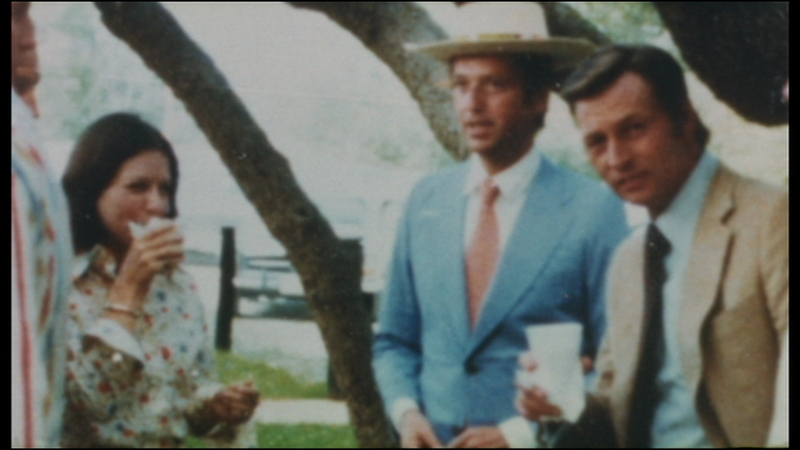 The film uses a photograph to introduce the story of Traudl and the couple’s first encounter in Texas (fig. 7). It seemed to have been love at first sight; Traudl smirks as she narrates how this gentleman she had just met addressed her formally with the German “Sie,” saying right away “I would like to marry you!”—after knowing each other for three days—“You are crazy! You ARE married!” she replies. Shortly after, Herrhausen was the first active board member in the history of the Deutsche Bank to go through a divorce (Veiel, “Black Box BRD” 114). When Traudl gets the testament letter out of the drawer and reads aloud what her husband has written with regard to a possible kidnapping, it leaves her speechless (fig. 7). The direct confrontation with the past demands much from her, and the letter seems to have become Traudl Herrhausen’s own personal symbol of her husband’s ability to make the right decisions. Moments like the one described above illustrate the film’s documentary genre and, in particular, a documentary without direct narration. It becomes graspable how subjective memory actually is. This raises a question as to the legitimacy of actively coping with the past through the use of violence since interpreting the past is subjective. Herrhausen’s testament was a preventive, rational, and counter-violent act. 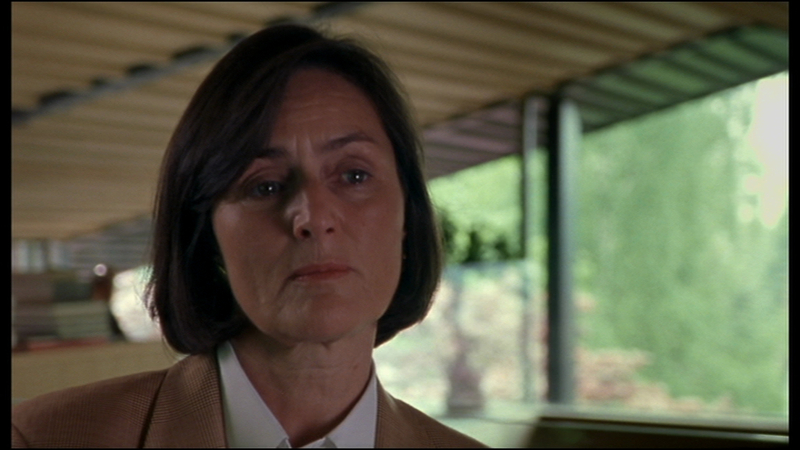 Right after the father’s emotional engagement with the past, the film enlarges upon the question of how Grams became connected with terrorism and his own legitimization of violence (Homewood “Challenging the Taboo” 119). Gerd Böh, a friend of Grams from the RAF sympathizer scene (Veiel, “Black Box BRD” 122), relates that Grams pushed himself further to dehumanize his targets / enemies. Böh builds on the question of hate but also the legitimization of violence that has been addressed already by Werner Grams. This transition scene approaches this issue from a different, one could say, left wing, insider perspective and opens up, according to Öhner, interesting “converging points” (Öhner 24). Grams believed, according to Böh’s recapitulation one of their many discussions (Veiel, “Blak Box BRD” 164), that “one should be able to project so much hate that one would be able to kill somebody with one’s owns hands” (Veiel “Black Box BRD” 165). Hanging up a cloth in his arbor, Böh describes this process of dehumanization (fig. 10). Even though the cloth says “The fallen continue to live in our battle […],” he and his petit bourgeois settlement seem quite far from any real political radicalization and far from seeing the human being merely as his “function.” He was not able to take this step of radicalization of killing somebody (Veiel “Black Box BRD” 140). Though Griese claims that the film “breaks apart old stereotypes and does not establish new ones” (Griese 172), the aforementioned scene would seem to undermine her argument. Böh himself, a former RAF sympathizer, is portrayed as a conformist. The cloth serves as the last expression of his long gone revolutionary past. Ironically, what Traudl Herrhausen, Werner Grams, and Gerd Böh have in common, are doubts on how they might have contributed to both Herrhausen’s and Grams’ social “isolation” (Homewood, “Challenging the Taboo” 123). And this enactment stands in contrast to the outlined motive of the process of dehumanization. Traudl Herrhausen, Werner Grams and Gerd Böh are far from dehumanized narrators of their memories. 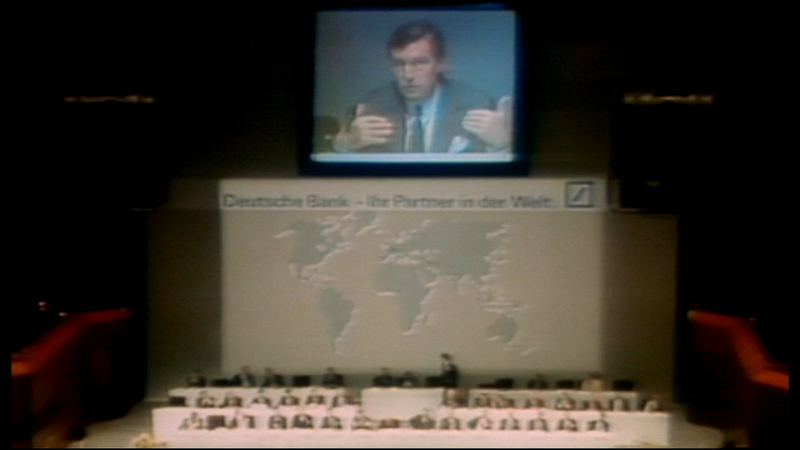 Later when Hilmar Kopper, former Deutsche Bank spokesperson, talks about Alfred Herrhausen’s persistent wish and mission to erase the Third World’s dept, the tendency to depersonalize human beings is reversed in an ironic and tragic way: Herrhausen, in Kopper’s eyes, ignored the impact of possible debt relief on the Deutsche Bank. According to Kopper, Herrhausen did not, however ironically, see the bank in its main function of raising capital. Veiel, in his accompanying book, informs his audience that Kopper was announced as the new Head of the Board one day after Herrhausen’s funeral (Veiel, “Black Box BRD” 264). In the film, Kopper sits in front of a significant artwork, Couple by the Russian artist Maxim Kantor (fig. 11). The painting shows two gaunt male figures clinging to each other, seeking shelter. Having himself presented in front of this piece of art raises uneasy questions about Kopper’s loyalty towards Herrhausen. Kopper not only located himself in front of this specific painting in the film, but also had himself portrayed in front of the painting in 2002 by the photographer Wonge Bergmann. The gaunt male figures do not speak for Kopper’s empathy. This setting raises questions about Kopper’s “reputation and function as a representative of a bank” and “weakens his credibility” (Ullrich 31). In the context of the film, the portrait is symbolically laden; it puts another complexion on Kopper’s and Herrhausen’s male friendship, and perhaps symbolizes the possible dependency of the positions in the Deutsche Bank. 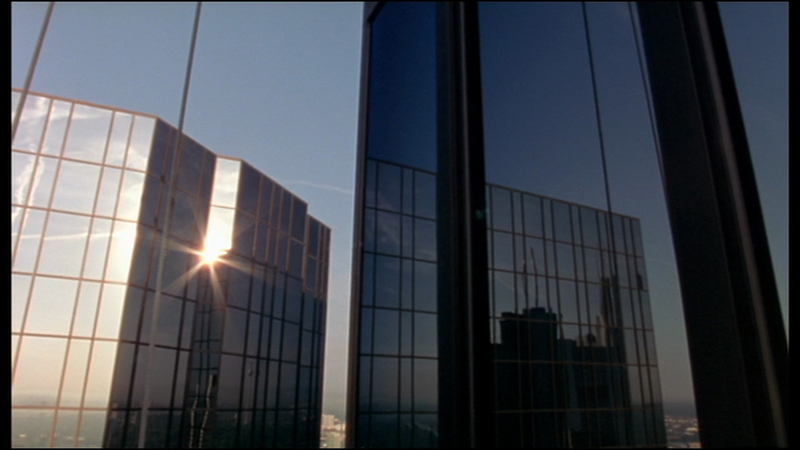 The selected scenes illustrate a major element of the film: the characters are filmed in their assumed safe spaces, thereby presenting their backdrops as reflections of their persona. In addition, the film uses a sharp cutting of the scenes by stringing together the specific spaces and topographies by which Herrhausen and Grams were surrounded (figs. 12–14). The different topographies also are markers for social class (Trnka 15). The air-to-air shots above the financial district in Frankfurt and the glass facades of the Deutsche Bank towers contrast with the enclosed, bourgeois spaces like the dining room of Ruth and Werner Grams. This draws attention to Frankfurt am Main and Wiesbaden as scenes of public, therefore political action (11). The already mentioned dissonance, directness and missing annotation shape the message of the film – the viewer has to deal with the uneasiness of an unresolved case since the film does not explain the context stringently. The private film recordings of both main protagonists, on the other hand, often appear artificially aged, an aspect that is pointed out by the research addressing “Herrhausen’s generational position between Grams’s father and Grams” (Trnka 15). Private film recordings switch with tracking shots of, amongst others, the Frankfurt financial district, Gerd Böh’s arbor, the living room of Ruth and Werner Grams and Traudl Herrhausen’s house (18). 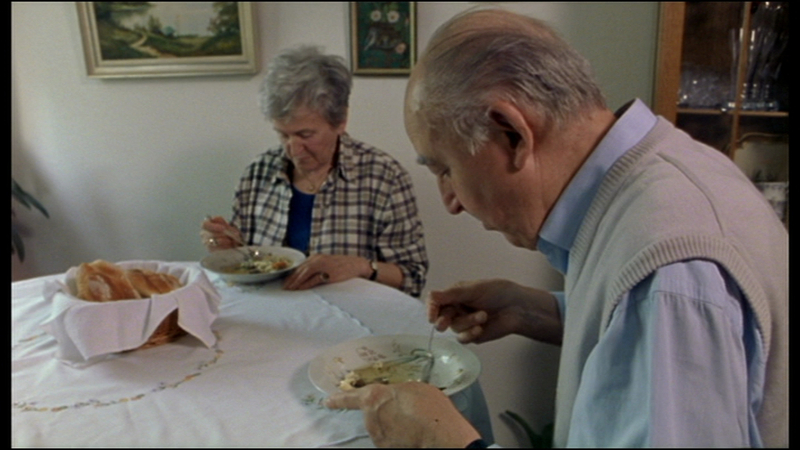 The montage positions the dead bodies of Herrhausen and Grams in the year of the film’s making, in 2001, and claim an assurance of their former presence in this world. It is a look into the “internal structures” of both Deutsche Bank and the left wing sympathizer scene, specifically, how somebody could have decided to go underground and fight radically while some of the former sympathizers decided to go a different path. These shots, in combination with the historical material, also tell the story of West Germany (Gerhardt 65) and tie the depersonalized mug shots of the RAF members into a larger frame of the private and public political sphere (Trnka 16) (fig. 15). The film, instead of viewing the victim and perpetrator “in their functions,” uses their biographical details to portray them as individuals. Not only are mug shots of Grams shown, but also pictures from his youth (fig. 16). As Homewood summarizes, “Super 8mm film footage of a family holiday in Spain shows a playful Grams emerge from a half-buried position in the sand (Homewood, “Making Invisible History Visible” 239). How hard it is to grasp the gap between the beloved son and the publically hunted terrorist on the mug shots is shown in the scene in which Ruth Grams presents an art work that her son embroidered underground (fig. 17). The tapestry shows a coast-line, sand, and a ship with hoisted sails. 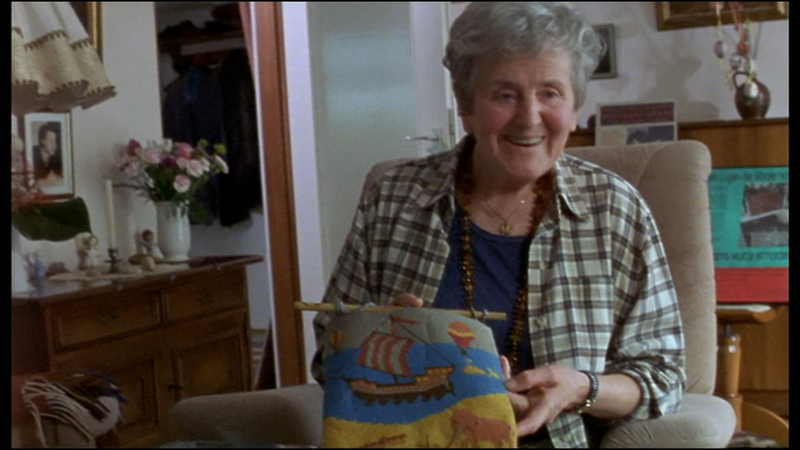 Homewood compares Ruth Grams’s interpretation of the tapestry with “the task of the spectator” (124)—the interpretation of Grams’s character, which is only suggested through the film’s montage. The mother, Ruth, is emotionally attached to the artwork her son produced while living underground. It is one of the few belongings of their son they still possess (Homewood, “Making Invisble History” 240). During his time underground, the parents saw their son only once in 1992 and this should be their last encounter (Veiel, “Black Box BRD” 41). They spent some days with Grams and his girlfriend Birgit Hogefeld, who appears in the film only twice, in a mug shot and in a black and white photograph that the director blended into the background while his film narrates the secret encounter between the parents and their son. The family spoke about the “new orientation of the means and goals of the RAF” (Veiel, “Black Box BRD” 270). The parents still seem to hope for an Aussteigen (a pulling out of the RAF), even though the viewer implicitly understands that the engagement in the RAF is a dead end; an Aussteigen in a tragic sense seems hardly possible. Through the use of the montage of old film and photo material, as pointed out by Trnka and Griese, traditional chronological sequences become warped. Alfred Herrhausen and Werner Grams are close in terms of their date of birth, 1925 and 1930 respectively. 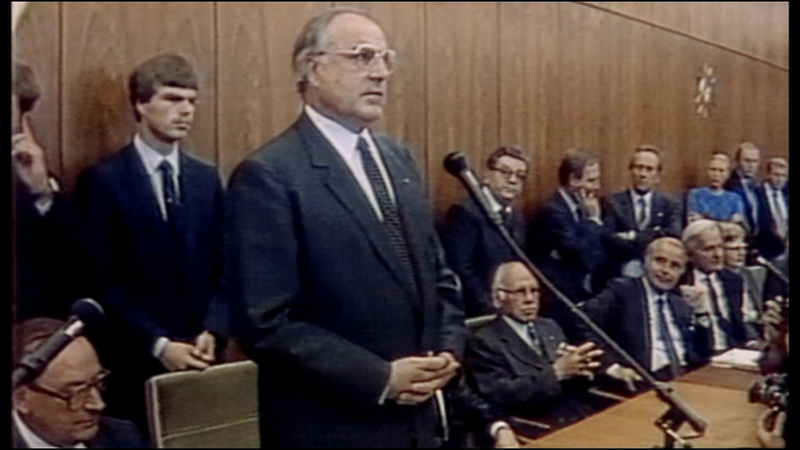 As his close friend and former chancellor of the BRD, Helmut Kohl (from 1982 to 1998) says in the film, Herrhausen fell under the “Gnade der späten Geburt” (mercy of the late birth), that prevented him from having to participate actively in the war, although he was a student at the elite Nazi school in Feldafing (fig. 18). But since Herrhausen’s appearance in the film is constructed (he is a dead, invisible body and not physically present) he seems much younger. The years between his death in 1989 and the film in 2001 leave no trace on him as they have left in real life on Grams’s father, Werner. Tying these abstractions into Helmut Kohl’s statement at his inauguration in 1982 (fig. 19) such as Öhner does: “I believe, that what lies ahead of us, also of me personally, is, with all necessity of the economic problems, first of all, an intellectual-moral challenge” leads the viewer to reflect upon the concept of “patriotism” (25). About Herrhausen’s politics, Kohl remarks on his “gelebten Patriotismus” (lived patriotism). 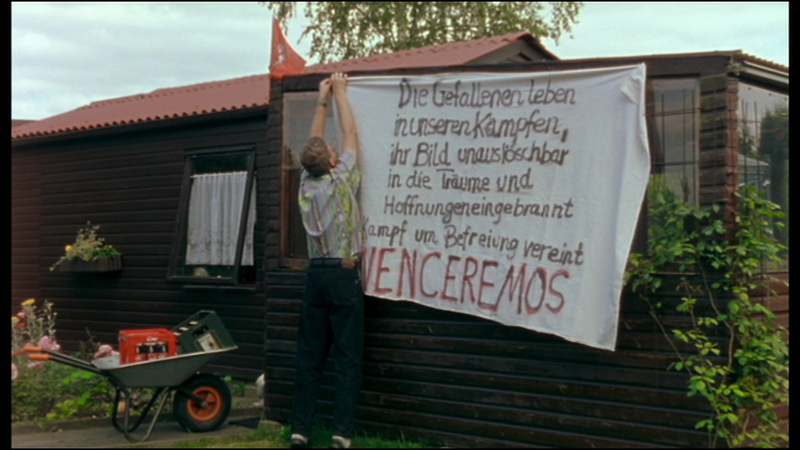 When in the following scene Gerd Böh hangs up the German flag in his arbor, it becomes obvious that patriotism is a subjective concept. Through this montage, an era of West Germany and its foundation is shown in its disruptions just as the history of twentieth-century Germany is entirely marked by disruption. Even the supposedly autonomous RAF absorbed that idea of patriotism, seeing their actions as a tool to free the people from the hypocritical state. Through the visual reminder of the invisible, dead bodies and the former RAF generations, the tragic climax of the deaths gets established right at the beginning. 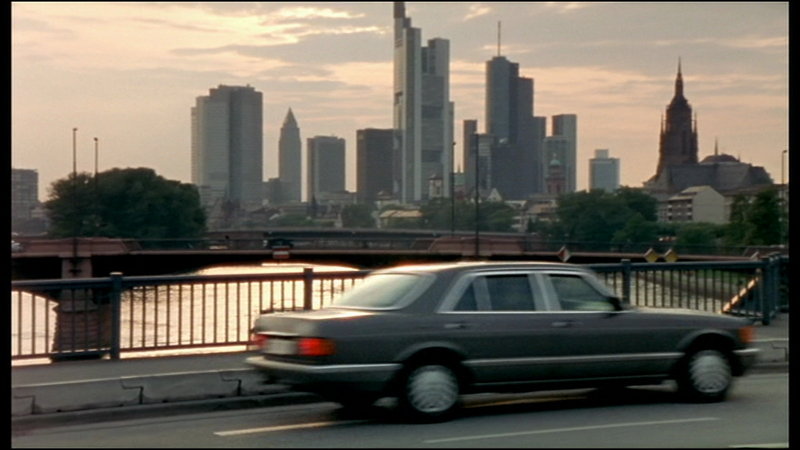 Gerd Böh’s interview sequence, which I already mentioned, is sharply contrasted with the three Mercedes driving along the Frankfurt skyline (fig. 20); in the background Pater Augustinus is re-phrasing what his friend Herrhausen said about the possible threat of an attack by the RAF: “We are, in the end, all in the hand of god.” With this statement, the film draws a line back to the beginning. The film starts with shots of Herrhausen’s and Grams’s places of death. Technically, Herrhausen’s and Grams’s bodies have no point of contact. But the montage history of the BRD (FRG) constructed from the narratives that emanate from two dead bodies, serves as a “metaphor,” an immaterial image, for internalized coping with the “trauma” caused by the terroristic acts of the RAF (Elsaesser 21). The film poster has the subtitle “Der Kampf ist vorbei. Die Wunden sind offen” (“The struggle is over. The wounds are open”), which, according to Homewood is “underlining that, far from being a closed chapter in the history of the Federal Republic, the terrorist past still needs to be worked on” (Homewood, “Making Invisible History” 246). Veiel finds his position in this re-contextualization of history, and, by re-telling the story through a documentary without commentator, Veiel makes obvious the constructedness of historiography. The film looks at the “wounds,” a term used by Veiel as well as the research, left in the socio-cultural collective awareness and memory by RAF terror. Berendse in his essay on the “reciprocity of the relationship of political violence and aesthetics” speaks of the “Wunde RAF” (“wound RAF”) (Berendse “Wunde RAF” 11). Hardly any of the terrorists of the third-generation of the RAF were caught. On the film poster, the faces of Herrhausen and Grams are combined (fig. 21). 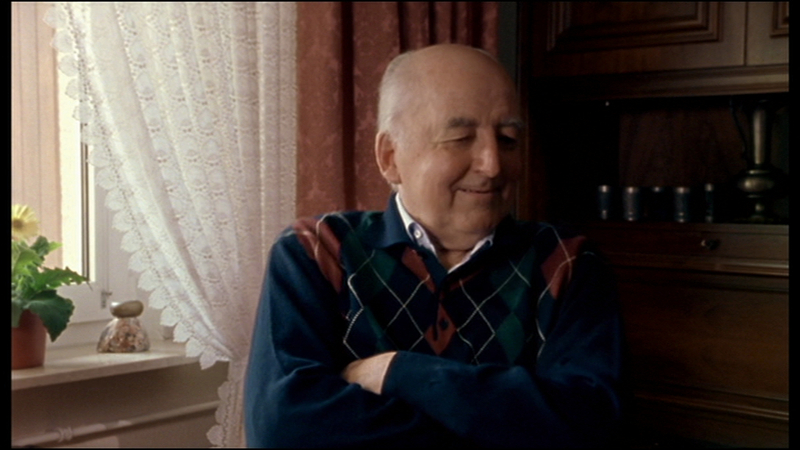 The montage face has a Schnittstelle (cut surface), but it also symbolizes a reciprocal relationship between the terrorist and the victim, a consistent theme within the film. Terrorists and victims are in a relationship of dependence and live in a common sphere of threat, vulnerability and violability (Elsaesser 21). This threat involves more than victim and perpetrator; it also menaces the young democratic nation of the BRD. A “dead aesthetic phenomenon” guides the viewer through the reconstruction of the life scenarios (Homewood, “Making Invisible History” 231). Grams’s autonomy as a terrorist transforms him into the object that causes the “trauma”: Thomas Elsaesser speaks of “das Gespenst” (the ghost) in terms of the “afterlife of the RAF” (Elsaesser 21). Also dead bodies can speak. “The dead body of the victim” is a symbol of a “speechless sign,” “while the moribund body of the terrorist becomes a weapon” (Zeller 203). The strict division between perpetrators and victims is dissolved in this dependency (Homewood, “Making Invisible History Visible” 238). Soon it becomes obvious; the life scenarios of both illustrate the motto of the generation of 68: “The Personal is Political” (Colvin 50). Every social democrat has to mourn every death that is caused by an ideology of blind hatred. […] And, after all that the members of this group did to the citizens of our country, it is not permissible, as long as they are awaiting trial, to accommodate them in convalescent home. They have to take on the inconveniences of a prison. 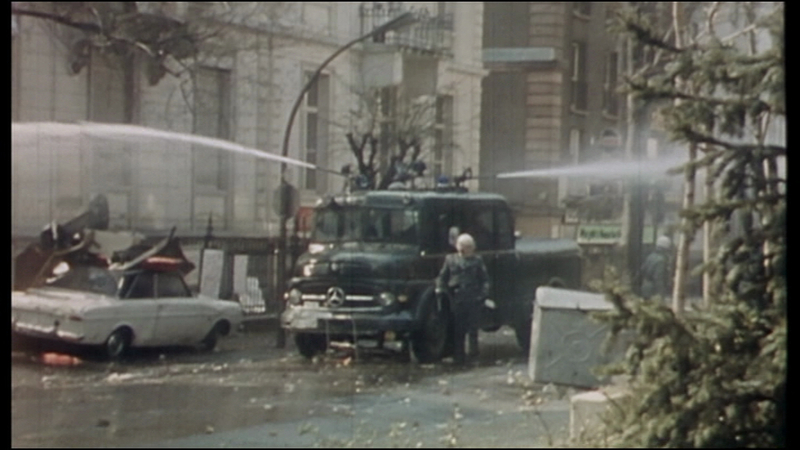 The film begins with the iconic image of the burned Mercedes in which Herrhausen was killed (fig. 24). The cars were supposed to protect Herrhausen from possible attacks, but he ends up dying in one of them. Both Grams’ and Herrhausen’s fate appears in the form of three dark Mercedes that appear throughout the film repeatedly. Their ride also reminds the audience of the train at the end of the film—a link to the train station in Bad Kleinen where Grams died. 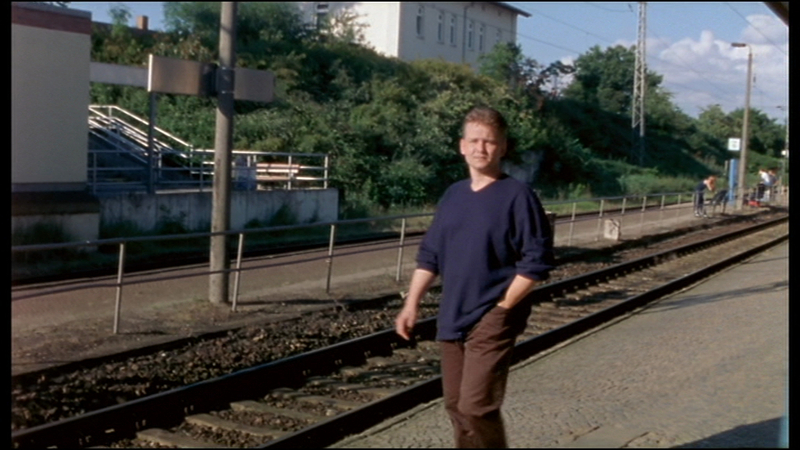 Synchronically with the narration of Traudl Herrhausen about how her husband died, at the beginning of the film, Rainer Grams, the brother of Wolfgang, retraces the path his brother took at the train station in Bad Kleinen. He shows the spectator the train tracks on which his brother died (fig. 25). As Veiel in an interview states, “I only make offers with my film, and the projection surface is large enough for various imaginings. 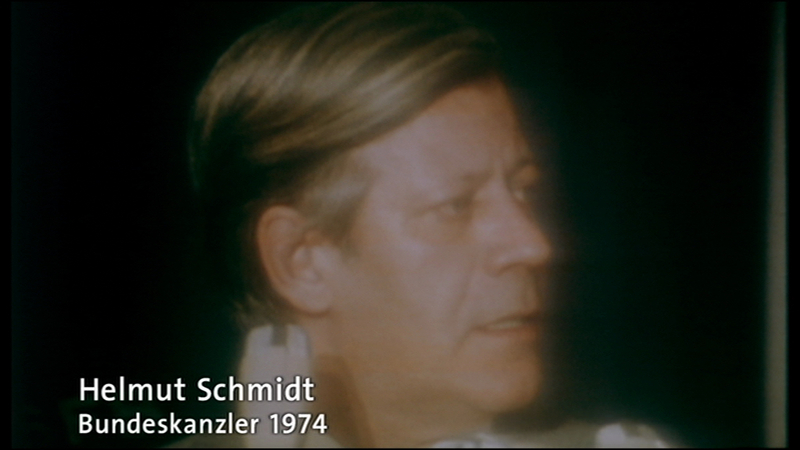 […] BLACK BOX BRD is a film about the present” (Volk 19), the film ends aesthetically with the same message it started with: Aussteigen (getting out) is not possible, neither for Herrhausen or Grams nor the contemporaries related to them, nor for the citizens of the BRD, as chancellor Helmut Schmidt stated in his speech, nor for Germany today. 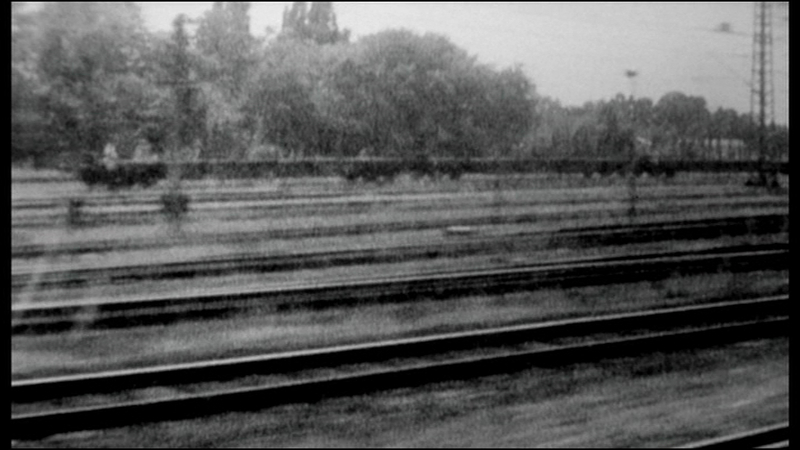 In the last scene, the director films from a moving train, showing the landscape. When the train nears the city, a voice in the background gives the announcement: “We are shortly arriving in Bad Kleinen.” Before, however, the train arrives at a full stop, before Aussteigen would even be an option, the closing credits begin to roll, again merging the two life scenarios, again reminding, that the case is unresolved. On May 7, 2001, five days before the film release (Veiel, “Black Box BRD” 279), the third-generation RAF almost seemed to take shape, when “by virtue of new DNA-testing technology the ‘Bundeskriminalamt’ (BKA) revealed that a hair found at the scene [of the killing of Detlef Rohwedder] purportedly belonged to Wolfgang Grams, thus linking him to the killing” (Homewood. “Making Invisible History” 238). The BKA, though, did not name Grams as a suspect, since the finding was not considered to be sufficient evidence (279). 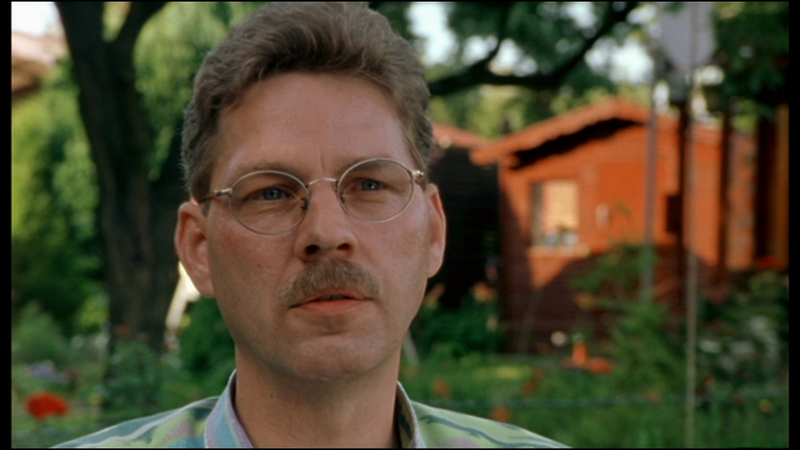 Assmann, Aleida. Einführung in die Kulturwissenschaft. Grundbegriffe, Themen, Fragestellungen. Berlin: Erich Schmidt Verlag, 2011. Print. Assmann, Jan. Cultural memory and early civilization: writing, remembrance, and political Imagination. New York: Cambridge University Press, 2011. Print. Berendse, Jan-Gerrit. “Die Wunde RAF: Zur Reziprozität von Fiktion und Terrorismus im Spiegel der neuesten Sekundärliteratur.” seminar 47.1 (February 2011): 10–26, www.muse.jhu.edu. —. “Kampf dem Leviathan, oder Kool Killer in Stammheim.” Die (k)alte Sachlichkeit: Herkunft und Wirkungen eines Konzepts. Eds. Moritz Bassler [et al.]. Würzburg: Königshausen und Neumann GmbH, 2004, 211-221. Print. Biehl-Missal, Brigitte. Wirtschaftsästhetik. Wie Unternehmen die Kunst als Inspiration und Werkzeug benutzen. Wiesbaden: Gabler Verlag, 2011. Print. Christiansen, Frank. “Rohwedder-Mord: Neue Spur führt zu RAF-Terrorist Grams.” Spiegel Online. 15 May 2011. http://www.spiegel.de/politik/deutschland/rohwedder-mord-neue-spur-fuehrt-zu-raf-terrorist-grams-a-134242.html, 09/03/13. Colvin, Sarah. Ulrike Meinhof and West German Terrorism. Language, Violence, and Identity. Rochester: Camden House, 2009. Elsaesser, Thomas. Terror und Trauma. Zur Gewalt des Vergangenen in der BRD. Berlin: Kulturverlag Kadmos, 2007. Print. Gerhardt, Christina. “Narrating Terrorism: Kristina Konrad’s Große Freiheit, kleine Freiheit (2000).” seminar 47.1 (February 2011): 64–80, www.muse.jhu.edu. Griese, Anne-Kathrin. “Der familiäre Blick. Andreas Veiel Black Box BRD & Christoph Hein In seiner frühen Kindheit ein Garten.” NachBilder der RAF. Literatur-Kultur-Geschlecht. Eds. Inge Stephan und Alexandra Tacke. Kleine Reihe, Band 24, Köln: Böhlau Verlag, 2008, 165–80. Print. Gugutzer, Robert. Soziologie des Körpers. Bielefeld: transcript, 2004. Print. Haberlander, Michael. “Die Guten und die Bösen.“ artechock. http://www.artechock.de/film/text/kritik/b/blbobr.htm, 09/03/13. Hake, Sabine. German National Cinema. Second Edition. New York: Routledge, (2002) 2008. Print. Hayward, Susan. Cinema Studies. The Key Concepts. Third Edition. New York: Routledge, (1996, 2000) 2006. Homewood, Chris. “Making Invisible Memory Visible: Communicative Memory and Taboo in Andres Veiel’s Black Box Brd.” Baader-Meinhof Returns: History and Cultural Memory of German Left-Wing Terrorism. Eds. Berendse, Gerrit-Jan, and Ingo Cornils. Amsterdam: Rodopi 2008, 231–50. —. “Challenging the taboo: the memory of West Germany’s terrorist past in Andres Veiel’s Black Box BRD (2001).” New Cinemas: Journal of Contemporary Film Volume 5: 2, 2007, doi: 10.1386/ncin.5.2.115/1, 115–26. “Interview mit Andres Veiel” Das Wissensportal der deutschen Filmakademie (Knowledge Portal of the German Film Academy). http://www.vierundzwanzig.de/regie_dokumentarfilm/interview_mit_andres_veiel, 09/03/13. Kellerhoff, Sven Felix. “Bad Kleinen—die ‘Exekution’ war ein Medienskandal.” Die Welt. 27 June 23 2013. http://www.welt.de/geschichte/article117494112/Bad-Kleinen-die-Exekution-war-ein-Medienskandal.html, 12/12/13. O’Brien, Mary-Elizabeth. Post-Wall German Cinema and National History. Utopianism and Dissent. Rochester: Camden House, 2012. Print. Öhner, Vrääth. “Was ist eine >Black box<? Vom Verschwinden des Politschen.” Ästhetik & Kommunikation, Politik im deutschen Kino. Heft 117, 33. Jahrgang, Berlin: Ästhetik & Kommunikation e. V., 2002: 21–28. Print. Pauleit, Winfried. “Politik im deutschen Kino heute. Dialoge, Leerstellen und Lektüren im Kaffeesatz.“, Ästhetik & Kommunikation, Politik im deutschen Kino. Heft 117, 33. Jahrgang, Berlin: Ästhetik & Kommunikation e. V., 2002: 12–14. Print. Palfreyman, Rachel. “The fourth generation: legacies of violence as quest for identity in post-unification terrorism films (2001).” German Cinema Since Unification.Ed. Clarke, David. London New York: continuum, 2006. Print. Passmore, Leith. Ulrike Meinhof and the Red Army Faction. Performing Terrorism. New York: palgrave macmillan, 2011. Print. Peters, Butz. Der letzte Mythos der RAF. Das Desaster von Bad Kleinen – Wer erschoss Wolfgang Grams? Berlin: Ullstein, 2006. Print. Preece, Julian. Baader-Meinhof and the Novel. Narratives of the Nation / Fantasies of the Revolution, 1970-2010. New York: palgrave macmillan, 2012. Print. Schmincke, Imke. Gefährliche Körper an gefährlichen Orten. Eine Studie zum Verhältnis von Körper, Raum und Marginalisierung. Bielefeld: transcipt, 2009. Print. Sontheimer, Michael: “Der Schlüssel zum RAF-Code.“ taz.de. 10 Apr. 2010. http://www.taz.de/1/archiv/digitaz/artikel/?ressort=pb&dig=2010/04/10/a0040&cHash=4f63315b2f, 09/03/13. Trnka, Jamie H. “‘The Struggle Is Over, the Wounds Are Open’: Cinematic Tropes, History, and the RAF in Recent German Film.” New German Critique 34.2 (2007): 1–26. http://ngc.dukejournals.org/. Ullrich, Wolfgang (Ed.). Macht zeigen. Kunst als Herrschaftsstrategie. Eine Ausstellung des Deutschen Historischen Museums Berlin, Deutsches Historisches Museum: Berlin 2010. Veiel, Andres. Black Box BRD. Deutschland: Zero Film GmbH, 2001. —. Black Box BRD. Alfred Herrhausen, die Deutsche Bank, die RAF und Wolfgang Gram. Stuttgart / München: Deutsche Verlags-Anstalt, 2002. Print. —. Deutsche Welle TV. Andres Veiel | Film Maker (in English) http://www.youtube.com/watch?v=SRAJ6oNAWL8, 09/15/13. —. Andreas Veiel on documentary film—cine-fils.com (in German, with English subtitle). http://www.youtube.com/watch?v=ziAocSANrFw, 09/15/13. Volk, Stefan. Black Box BRD. Filmheft von Stefan Volk, Filmheft der Bundeszentrale für politische Bildung (BpB), Augsburg 2001. Print. Zeller, Christoph. Ästhetik des Authentischen. Literatur und Kunst um 1970. Berlin / New York: Walter de Gruyter GmbH & Co, 2010. Print. “Nach 18 Jahren: Ex-Raf-Mitglied Hogefeld aus Haft entlassen.” Spiegel Online. 21 June 2011. http://www.spiegel.de/politik/deutschland/nach-18-jahren-ex-raf-mitglied-hogefeld-aus-haft-entlassen-a-769730.html, 12/12/13. Veiel, Andres; Black Box BRD. Zero Film GmbH: Deutschland 2001. I would like to thank Luanne Dagley for her thoughts and help in reading and editing my paper. Black Box BRD: Filmheft von Stefan Volk, Filmheft der Bundeszentrale für politische Bildung (BpB), (Black Box Germany: Film Journal by Stefan Volk, Film Journal of the German Federal Agency for Civil Education), Augsburg 2001. According to recent remembrance debates, what finds its way into a society’s well of “collective memory” are not just historical facts, but rather a “shared and remembered memory filter”, as Jan Assmann states (Jan Assmann 2011, 5-11). Chris Homewood refers in his research on the film on Assmann’ “theory of communicative and cultural memory” (Homewood, “Making Invisible History Visible” 233) and interprets the films approach as a contribution to “break an ostensible taboo namely a ‘them and us’ ideological deadlock” (213) and therefore to “depolarize the victim/perpetrator dichotomy” (238). Veiel, under the same title, also published a book about his film research, which provides additional background information, for example the RAF letters in which they claim responsibility. Also the book connects chronological coherencies; the book makes much more obvious that Herrhausen officially was on the list of the RAF and that the Bundeskriminalamt (Federal Criminal Police Office) might have failed with their provided personal security service. Since my paper traces how the images in the film reconstruct “internal structures of both RAF and Deutsche Bank”, equally of the BRD, I draw upon Veiels material that he gathered beyond the film. “Black Box BRD stands out because of how it accomplishes the shift away from the first- and second-generation RAF members, Berlin countercultures 1977, and Stuttgart Stammheim and which previously unheard narratives it introduces the cinematic history and memory of the RAF. By focusing on Frankfurt as the narrative center of his documentary, Veiel opens up a broader set of historical relations and events than is typical of accounts of German terrorism” (Trnka 10). Claim of responsibility of the RAF: „Am 30.11.1989 haben wir Alfred Herrhausen … hingerichtet. Durch die Geschichte der Deutschen Bank zieht sich eine Blutspur zweier Weltkriege und millionenfacher Ausbeutung, und in dieser Kontinuität regierte Herrhausen an der Spitze dieses Machtzentrums der deutschen Wirtschaft […]. Herrhausens Pläne gegen die Länder in der Dritten Welt, die selbst in linksintellektuellen Kreisen als humanitäre Fortschrittskonzepte gepriesen werden, sind nichts anderes als der Versuch, die bestehenden Herrschafts- und Ausplünderungsverhältnisse längerfristig zu sichern …“ (Veiel 263). (“On the 30th of November ,1989, we … assassinated Alfred Herrhausen. A trail of blood stemming from two World Wars and the exploitation of millions runs throughout the history of the Deutsche Bank. In this continuity, Herrhausen reigned as the head of this center of power in the German economy […]. Herrhausen’s plans for the Third World countries, some of which were even praised among the leftist intellectuals as progress, are nothing more than the attempt to secure existing conditions of power and exploitation on a long-term basis.”) All translations into English, unless otherwise stated, are my own. I use the term “montage” according to Susan Haywards definition: “Montage creates a third meaning through the collision of two images.” (Hayward 112). Jamie H. Trnka, Rachel Palfreyman also use the term in the context of the film, as well as Stefan Volk. Jamie H. Trnka points out, “the tension between aesthetics of film form and the politics of personal and public memory” (Trnka 1). See exemplary: Berendse 2011, 19, and Griese, 170. See exemplary: Sven Felix Kellerhoff. “Bad Kleinen – die “Exekution“ war ein Medienskandal.“ http://www.welt.de/geschichte/article117494112/Bad-Kleinen-die-Exekution-war-ein-Medienskandal.html, 12/12/2013. See Volk on the commenting function of the montage (15). Griese analyzes the film in terms of familial relationships (167). “Erklärung: Ich, der unterzeichnende Alfred Herrhausen, Solingen Schloss Kaspersbroich, erkläre: Für den Fall meiner Entführung bitte ich auf unverantwortliche Erpressungen, die sich gegen den demokratischen Rechtsstaat der Bundesrepublik richten, nicht einzugehen. Solingen, den 11. September 1977.” Alfred Herrhausen (quoted according to Veiel 2002, 118, in the main text my translation into English). The film plot and the set of events are narrated according to Veiel’s accompanying book. „Nach 18 Jahren: Ex-Raf-Mitglied Hogefeld aus Haft entlassen“, http://www.spiegel.de/politik/deutschland/nach-18-jahren-ex-raf-mitglied-hogefeld-aus-haft-entlassen-a-769730.html, 12/12/13. Haberlander, Michael: Die Guten und die Bösen, http://www.artechock.de/film/text/kritik/b/blbobr.htm. Andreas Veiel on documentary film – cine-fils.com (in German, with English subtitle): http://www.youtube.com/watch?v=ziAocSANrFw, 09/15/13. Also, Homewood points out the connection to a certain “German idealism” (Homewood “Challenging the Taboo” 123). See also (Homewood “Making Invisible History Visible” 242-243) for his contextualization of the scene. “»Wenn sogar du das nicht mitträgst, wenn sogar du zweifelst, wenn sogar du mich verlässt, dann weiß ich nicht, wie das weitergehen soll«” (Veiel “Black Box BRD” 114). „Du musst jemanden so hassen, dass du ihn mit der Hand erwürgen könntest“ (Veiel “Black Box BRD” 165). Kopper portraying himself in front of this art work was discussed by Wolfgang Ulrrich in the exhibition “Macht zeigen. Kunst als Herrschaftsstrategie” (Showing power. Art work as hegemony strategy) in 2010 at the Deutsches Historisches Museum, Berlin (German Historical Museum). See also: Biehl-Missal, Brigitte. Wirtschaftsästhetik. Wie Unternehmen die Kunst als Inspiration und Werkzeug benutzen, Gabler Verlag: Wiesbaden 2011, 104. 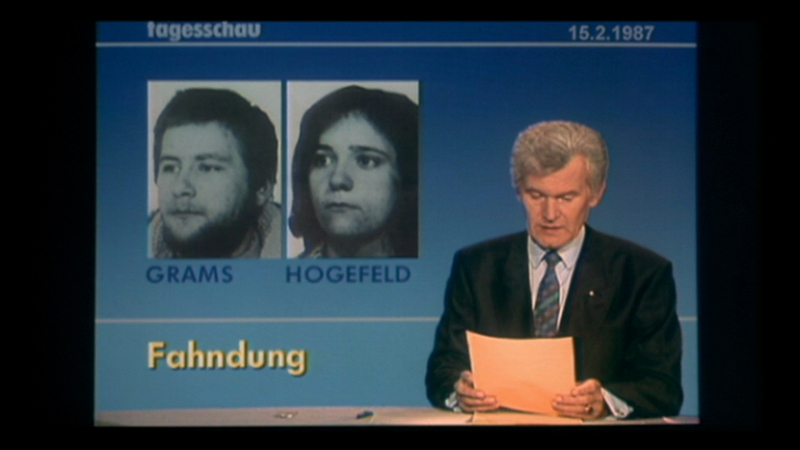 “[…] Veiel problematizes the dominant cultural perception of the organization in which Wolfgang Grams is reduced to the level of his image on the ‚Fahndungsplakaten‘[…] Through the use of photo-fit technology, the 15 February 1987 edition of Tagesschau, included in the film, goes on to detail the ways in which Grams may have changed his appearance to evade capture“ (Homewood “Making Invisible History Visible” 240). See also: Elsaesser, Thomas. Terror und Trauma. Zur Gewalt des Vergangenen in der BRD, Kulturverlag Kadmos: Berlin 2007. Deutsche Welle TV. Andres Veiel | Film Maker. http://www.youtube.com/watch?v=SRAJ6oNAWL8, 09/15/13. Hilgers, Micha: Die Radikalisierung des Gewissens. Von der Generalisierung des Ressentiments: Die RAF-Protagonisten als totalitäre Persönlichkeiten. http://www.fr-online.de/spezials/raf-protagonisten-die-radikalisierung-des-gewissens,1472610,2708748.html, 09/15/13. “Mir ist es schwer gefallen, so klar einzuteilen in >die Schweine< und >die guten Revolutionäre<. Aber das habe ich eher als einen Fehler von mir angesehen“ (Veiel “Black Box BRD” 108). See Schmincke (2009) and Gugutzer (2011). “Jeder Sozialdemokrat muss jedes Todesopfer beklagen, das als Konsequenz blindwütiger Ideologie erbracht wird. […] Und nach alledem, was die Angehörigen dieser Gruppe Bürgern unseres Landes angetan haben, ist es allerdings nicht angängig sie, solange sie ihren Prozess erwarten, im Erholungsheim unterzubringen. Sie müssen schon die Unbequemlichkeiten eines Gefängnisses auf sich nehmen“ (Veiel “Black Box BRD” 88). “Ich mache nur Angebote mit meinem Film, und die Projektionsfläche ist groß genug für verschiedene Vorstellungen. […] BLACK BOX BRD ist ein Film über die Gegenwart” (Volk, 19). Quoted by Volk according to www.black-box-brd, (Talk with Annette Schäfer).